Our hearing amplifier is convenient and durable to wear. It runs with high quality rechargeable lithium battery, Its great battery runs around 20-24 hours continuously after fully charged. It can be charged via USB cable. Question one: Why there is the whistling sound? 1. The ear plug is too small. 2. The ear plug is not really inserted into the ear canal. 3. The sound tube isn't connected tightly with the ear plug. 4. The sound tube isn't connected tightly with the ear hook. Question two: Why there is noise? which needs time to adapt to, please understand. be increased more obviously like the sound of wind. If it still can not help, please try to switch the programs. Generally, it takes 20 -30 days to get used to the sound. Please try to adapt to it. If you cann't, our quality commitment is "3 months Hassle Free Return policy, 3 year on hassle warranty!". When you first use this product, please charge the batter fully. Please turn off the power before assembling the hearing aid. EASY USE AND COMFORTABLE FEATURE: Our hearing amplifier designed by audiologist is easy, durable, and comfortable to wear in either of the ears. RECHARGABLE FEATURE: Our hearing amplifier saves your trouble to buy button batteries frequently. And it is environmental-friendly. 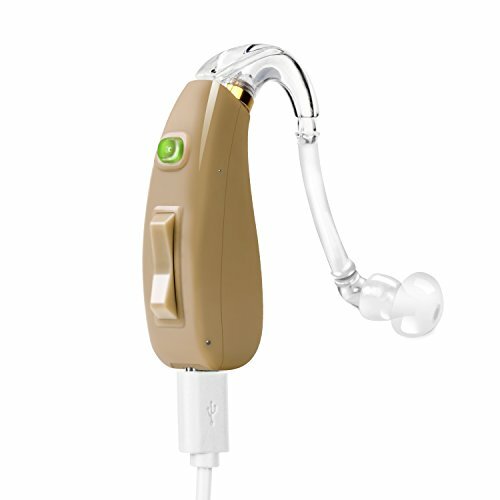 EXCEPTIONAL FUNCTIONS: Our hearing amplifier has a full digital tone quality for low audio distortion and clearer voice. It also has a noise reduction feature that helps the user hear with maximum clarity. It's with full digital circuitry and adjustable volume control. There are two process choices for noisy and quiet environment, which is more efficient and practical. GIFT DESIGN: Our hearing amplifier is offered with exquisite packaging and complete accessories. We provide the best storage protection.